← Why yes, I CAN, in fact, cook fish. I know I’m late on this. Like, really late. Shame on me. But better late than never, right? To tell the truth, I didn’t even tackle the first of this month’s Barefoot Bloggers recipe challenges until after the date it was supposed to be posted. This was partly due to my having nearly forgotten to check this months challenges in the first place, and partly because when I saw what they were, well, I just wasn’t thrilled. Its all sweet stuff this month, and the Banana Sour Cream Pancakes that were chosen by Karen of Something Sweet by Karen didn’t appeal to me much at all. You see, I can’t really eat bananas, at least not when they’re fresh. Everytime I’ve ever ingested bananas in any form other than baked goods I’ve ended up with terrible stomach cramps, and even if I absolutely LOVED the flavor of bananas (which I don’t) it wouldn’t be worth putting myself through the agony that would come afterward. So, as a general rule, I stay away. I might have the occasional banana nut muffin, but that’s about as far as I go. I thought for a moment that maybe, because these were pancakes, the bananas would be cooked enough that I’d be able to eat them. But then I looked at the recipe and saw that we were supposed to add fresh diced bananas to the pancakes while they were on the griddle, which meant they wouldn’t cook much at all. Then we were supposed to top them with MORE fresh bananas after they were cooked. Nope, couldn’t do it. I would’ve spent my entire Saturday paying for my breakfast. I considered taking a pass on this one, but then I thought about it and realized I probably could make these so they’d be safe for me to eat, if I adjusted the technique a bit. I thought that if the bananas were mashed up into the pancake batter as they would be in banana bread or muffins, they’d have a much better chance of cooking completely than if I was basically just searing some banana chunks into one side of the pancakes. So that’s what I did. My bananas were somewhat less than super-ripe, so they were a bit of a challenge to mash, but I managed with some good old-fashioned elbow grease and a particularly sturdy fork. I used a hand mixer to beat in the eggs, sour cream, sugar, lemon juice (didn’t have actual lemons so I just squeezed in some juice from a bottle… blasphemy, I know) and vanilla, but held off on adding the milk because I knew that the mashed bananas would add a fair amount of moisture on their own and didn’t want to end up with batter that was too runny. 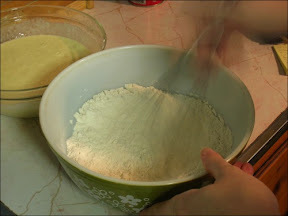 Instead I just mixed in the dry ingredients (flour, salt, baking powder, and some cinnamon and black pepper for a little extra oomph) and then added milk a small amount at a time until the batter looked more or less the way pancake batter should. 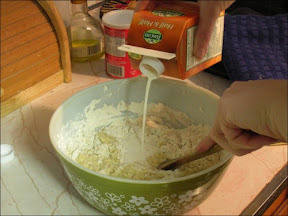 As I heated up our new cast iron griddle pan on the stove and let the batter rest, I considered topping alternatives. I could’ve just stuck to plain maple syrup, but I figured I’d already gone totally off the map with the pancakes themselves, I might as well try and be creative with the topping. I had some raw shelled almonds in the freezer, and thought that maybe a spiced toasted almond syrup would be a good match (although obviously walnuts would have been a better choice). I quickly chopped up about a half cup of whole nuts and tossed them into a shallow frying pan on the stove to toast over low heat. By the time they were nice and golden brown my griddle was hot, and it was time to deal with the pancakes, so finishing my topping would have to wait. My first set of pancakes didn’t work out so well. I greased the pan with a bit of butter, then tried to use a ladle to dish out the batter. 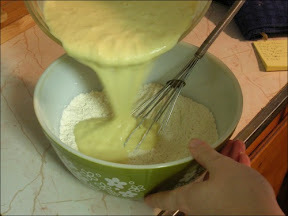 Only then did I realize that it was actually much too thick because I couldn’t get the batter out of the ladle! I employed a silicone spatula to empty the ladle, and then realized that the ladle created much too large a portion, so the pancakes were way too big to cook correctly. This fact was made even worse because I hadn’t allowed the griddle to heat up enough to cook evenly, so the parts of the pancakes that were in the middle of the pan burned, while the outer parts barely even set. Too thick batter + too much batter + improperly heated pan = three strikes, you’re out. Batch number one ended up in the garbage. I wiped down the griddle to start fresh, put it back on the heat so it could actually get fully got, and added some more milk to the batter so it’d be easier to portion and pour. And thankfully, the second batch and every one after that worked just about right – it was still a little tricky to time because the batter was still a bit thick, but I managed to make it work. Each batch of finished pancakes went into the oven which was heated to its lowest temperature to keep warm while I finished the rest. The pancakes were taking just enough time to cook to give me time to finish off my topping, so I put the pan with the almonds back on the heat, added a handful of dried sweetened cranberries (never been a huge fan of dried fruit, but I LOVE dried cranberries, because unlike most dried fruit they aren’t sickeningly sweet), a small spoonful of ground cinnamon and a generous amount of pure maple syrup. I let this just warm up and thicken a bit while I finished off the pancakes, and by the time they were done the cranberries had plumped and absorbed some liquid, the syrup had thickened a bit, and the nuts had candied themselves. I added a squeeze of lemon juice to finish it off, and plated up our breakfast. These were some seriously dense pancakes, but tasty. The banana flavor was mild, but definitely recognizeable. Honestly though, I think the topping was the real winner – crunchy nuts, chewy tart cranberries, and lightly spiced real maple syrup would make for a sweet and slightly complex finisher for any pancake recipe. I’m actually envisioning a topping with even more add-ins – pumpkin seeds, walnuts or pecans, perhaps some dried apricots or cherries – and calling it a trail mix topping. I think it’d especially be good over some buttermilk buckwheat pancakes for an earthy flavor contrast. Truthfully, I think these probably would have been great pancakes had I made them according to the recipe. And they might be worth making as directed, but with a different fruit – some sort of berry, perhaps, or some peaches (perhaps with some cream mixed in with the warm maple syrup). But even having mangled the recipe as I did, they were quite a tasty breakfast, filling and warming. And, my alterations accomplished what they were supposed to – the bananas got totally cooked, so, no tummy troubles later! This entry was posted in Food, Drinks and Cooking, Table for Two? Archives and tagged barefoot bloggers, breakfast, fruit, nuts. Bookmark the permalink. These pancakes sound absolutely amazing, and that topping is incredible. I must make these soon. Thanks for sharing! mmmm. those pancakes sound delicious! bananas and sour cream are such a natural combination. i love that you put a trail mix topping on there! What a persistent and innovative cook you are. Glad you enjoyed your pancakes – I think your topping looks fab! Hi Heather and Suzie, thanks for stopping by!